Warmastered Edition on PC is solid and probably the best way to play it. Dunno about 2/Deathinitive, pcgamingwiki mentions a few bugs. It's probably fine though. I recently played through the Warmastered PS4 version of 1 and the Deathintive PS4 version of 2. (Both to completion). The first is fine. It certainly looks prettier than the PS3 version and runs at least as well as my recollection of the PS3 original. Probably better. 2 on PS4, on the other hand, is mired by crash bugs. They're absolutely unavoidable, but their frequency will drop significantly if you turn off damage numbers in the options. Leave them on, and you're playing with fire. Crashes every hour, at least. Turn them off, and you can easily go 5-10 hours without crashes. I'm no expert on framerates, but I feel it performed poorer than the first did on the same platform. I was able to double-platinum both, so clearly there are no game-breaking issues. Up to you and your personal tolerances. I mean, with damage numbers off, I was able to clear all 101 waves in a single go of the Crucible DLC for the relevant trophies needed for the platinum. I read plenty of horror stories of crashes happening anywhere from wave 25 through 70 with damage numbers on. So there's an anecdote for ya. FWIW, I believe I read that Darksiders 2 Deathinitive Edition got an Xbox One X enhanced patch that broke some things. I do not know the details, but I know there was at least one semi-desperate thread here calling for an ETA on another patch to fix the issues. I don't know if it ever landed. For Darksiders 2 DE, you can download a Beta ver., being an update to the base game. For one thing it uses X1 inputs instead of 360 buttons and it has less stuttering. Darksiders 2 DE didn't crash on me at all and generally would run fine. Worse case scenario is if you are using certain software like say Borderless gaming or using an FOV fix that may cause the game to crash. I beat this game the other day and I absolutely loved it. Yes, there were a few technical issues, but it’s still fantastic. The environments were beautiful, with several different areas all having their own look. Fury is an absolute badass and this game easily had the best dialogue and cutscenes of any Darksiders. The callbacks to Darksiders 1 were just so well done. I fired up the original today and I’m noticing all the great nods 3 had to it. The combat was hard at first but after a while it just clicked. After beating the game I immediately started again and was wrecking everything in my path. Pre-release footage killed my hype, as did the reviews, but holy hell am I happy I still bought it. It’s my favorite of all 3, with 2 being the worst. Yup, they started showing off the game way too soon. Clearly before certain key gameplay components were properly implemented. It looked soooooo bad at first. And while it'll never be a looker, the final product wound up much tighter than that original gameplay reveal looked. Story-wise, it did have some of my favorite moments in the franchise, though the original's ending is still probably the single best cinematic moment in the series; and partly why I want a sequel to IT so badly. I immediately played through and platinumed the PS4 versions of 1 and 2 just after finishing this one's plat (since I had originally played them on PS3 ages ago), and the nods and call-backs are many. 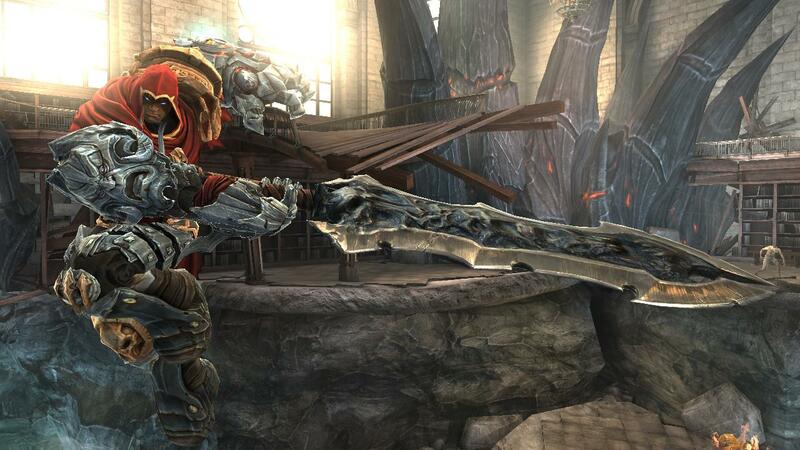 Hell, a lot of the enemy design is informed by the Earth portions of Darksiders 2. This surprised me, because at first blush, 3 felt like a cross between the original game and Dark Souls. But there's a fair smattering of Darksiders 2 there. Though sadly, not Death's voice actor. I was happy to see that War's voice actor returned, though! It never got any real coverage from mainstream media at launch or beyond,the critics panned it because you are either a AAA or an indie these days and only the fans of the previous ones cared for it. By all reports, the game launched in a pretty poor state, and you have to imagine that's the version reviewers had access to. It's gotten a number of rounds of critical patches that have done a lot to fix the game up to its current state. It's always been too much to expect an outlet to re-review a game that's seen extensive post-launch support. But then, that's the risk as a dev and as a pub of releasing a game a month or three shy of necessary balancing and polishing. Edit - Also, I imagine that most here that were interesting in playing it at current prices have already finished it. What is this game like now on ps4 pro? I heard it got a 60fps patch too? Is it still virtually impossible to beat on apocalyptic? I beat it on Apocalyptic on patch 1.03 (included lots of the bug/crash/performance fixes, but predated the Classic combat mode) and it was hardly impossible. I've got quite a few Soulsbornes-a-likes under my belt, it's true, but this wasn't one of the tougher ones, IMO. So I took a break and now I can not remember how to do that upwards dash to reach higher ground. Can anyone please remind me? Got the game with Origin Access Premier and I must say that I am really enjoying it! Maybe all the patches since release helped improve it? Either way, I am finding the story and characters enjoyable, the combat is pretty fun, and the graphics albeit not the best still offering a nice atmosphere. Enjoying my time with the game thus far. Just picked up the game yesterday and so far I like it. I knew that the game needed updates, but mostly I was waiting on gameplay changes. I heard that they added a "classic" combat system and that's what I'm using. It's really good looking and runs well on my PC (7700k, 980ti). There's some strange pop in when turning the camera around fast. I'm guessing that's just how the game renders. The Crucible DLC is live 2/26. the moment this goes on decent sale I'm grabbing it. Finally got a chance to start playing this with Origin Premier, and today I got a 20 GB update. I guess it's the update for the DLC, but it seems kinda odd considering Premier doesn't say it's the deluxe version of the game and I still have the option to buy the DLC separately showing. Is the Crucible dlc basically a version of Bloody Palace in DMC? Finally started this on Friday last week and just finished it now. Superb stuff. Massively overlooked really. Great game. Played and completed it back in January after they patched out the Souls aspect. Excellent story, characters and gameplay with a beautiful art style and visuals. Overall, an 8.5/10 for me and my favorite in the franchise with the original Darksiders being second and Darksiders 2 being last. Liking the game so far as well, the only thing I have trouble with is where to go sometimes. I find the compass on the top of the screen a bit of a hassle, and not always accurate. Easy to get lost.